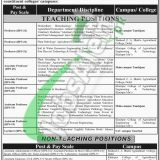 Here I am going to throw light on a recent career opportunity from Sindh Agriculture University Tandojam Jobs 2019 Online Form Download. Applications are being invited from the Sindh Agriculture University Tandojam which is paying its full regards and services in field of Agriculture and comprises of all the basic facilities and modern technologies is the wonderful university of Tandojam as like every time offers number of the vacancies on the basis of its needs of Masters to Graduation level and sometimes Matric level with awesome salary package and grow offers. Now, this university is looking to hire the well disciplined, calibre, capable and eligible applicants are required to fill the posts of (Professor, Associate Professor, Assistant Professor, Lecturer, Assistant Administrative Officer, Assistant Purchase & Store Officer, Sports Officer, Field Assistant, Laboratory Assistant, Assistant Engineer - Civil, Sports Officer, Sub-Engineer-Civil, Engineer Electrical) are the posts which needs to be filled as soon as possible. The overall qualification of Masters / Bachelors / DAE in the relevant discipline from the HEC recognized university with relevant expertise and the candidates should have served in the Govt and Semi Govt sectors are eligible to apply. Excellent salary package will be given to the applicants with brilliant atmosphere. Now, I will let you know about its applying criteria below. Applicants are required to obtain the application form by downloading it from the university website at www.sau.edu.pk or from the given link. The duly filled application form should reach to the Registrar Office before the due date. Only eligible applicants will be called for test/interview. So, stay tuned with this page ever for more vacancies. Address: Registrar Office, Sindh Agriculture University Tandojam.